It’s January. The holidays have come and gone, and now we’re left slogging through the rest of winter. It wasn’t an issue in November or December—we had all of Thanksgiving, Christmas and New Years to keep us occupied. The Holidays gave us time to enjoy time with family and friends, play with some new toys, and set some new goals for the year. Well now that year is hear, and if our recent lack of snow is any indication, the future may be full of freezing temperatures and a lot more snow. We may just be your local propane and heating oil company, but we think you should find joy in all seasons. Let’s get the one season we all know and love started early in 2019. Grilling season. If you’re an established grill master, you probably treat the waning days of March and April salivating at the prospect of dusting off the grill. Let’s get going early, indoors, with help from a few of these tips. Want to grill indoors? Get a grill pan! Grill pans are readily accessible, simple to use, and reasonably inexpensive. Using one indoors on your stove top can be almost just as effective as an outdoor propane grill. What should you look for in a grill pan? We suggest looking for a cast iron grill pan with a lot of mass and high ridges. Many pans have shallow ridges where food doesn’t lift enough drain grease. Would you throw a slab of meat on your propane grill without preparing your grilling surface? Of course not. Same applies to a grill pan. Preheat your oven to 375 degrees then rub canola oil or vegetable oil on your pan with a paper towel. Place the pan in the oven for 30 minutes and let it completely cool while inside. Now it’s pre-seasoned and ready to go. From now on, you only need to season and oil your food, not the pan. We’re not getting rid of all the fat and grease, just be aware that you’re grilling indoors, in a contained environment. Trip a little more grease and fat off of your meat before marinating and throwing it on your grill pan. Less fat equals less grease and smoke. Less smoke means less waiving towels and pillows at smoke detectors. Adding a little less marinade will also do the trick. When your food is five degrees away from your desired internal temp, tent it with foil for an additional 5-15 minutes. It’ll cook up to temperature during that time, and allow juices to redistribute for a perfectly tender meat. Hopefully these few tips will give you a little more confidence as an indoor grill master. 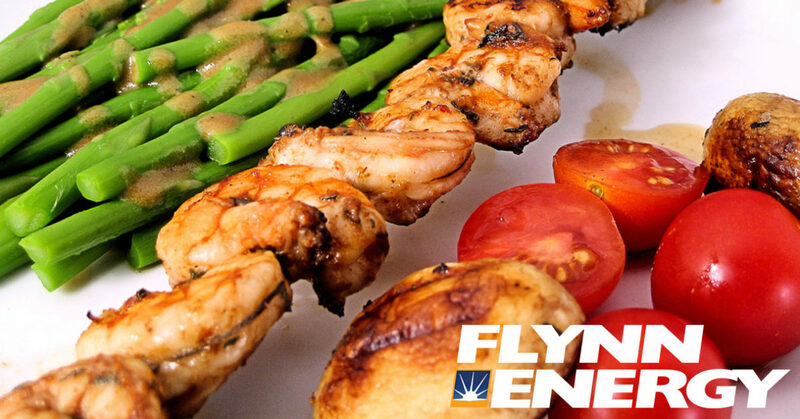 At Flynn, we offer propane and heating oil products that keep you warm during the long winter. When spring and summer comes around, we’ll be around to help you fill your propane tanks for grilling as well. In the mean time, visit us online to sign up for heating oil or propane delivery, order a refill, or ask us questions. We’re here to delivery tomorrow’s energy, today.